By Graham Vanbergen – All the Brexit promises made by this Conservative government have been broken. From David Cameron telling everyone before the EU referendum that joining the WTO as an independent nation would be both simple and automatic to Theresa May’s strong and stable management of both the country and government. From Boris to Mogg – the think tanks to the front charities, from the institutes and economists to the right-wing national newspapers – they were all wrong. In reality, Brexit itself only really came about because of political promises that had been broken. From a strangulated NHS to the never-ending crisis of daily life such as housing, poverty, social care and much more. The social contract between a government and working for the good of the nation broke down. And the pain went on and on – from corrupt bankers and corporate tax dodgers to the stashed billions of desperately needed tax revenue laundered through British tax havens – everyone that was not well-off felt the pain. All of the promises made by politicians – from Thatcher to May without forgetting the shame of war criminal Blair – it has all been one long con job. No-one believes anyone any more. Brexit happened because of all of this. A confident, upstanding, modern country fit for the 21st century would not regress at such frightening speed it has since 2016. One week before the EU referendum, one-third of voters who went to the polls on that fateful day were swing voters. Yes, there were diehard Remainers and Leavers but of the 33 million who voted, over 10 million were not convinced one way or the other. And here we are – a nation mired in a political and constitutional crisis with economic uncertainty about to drive a self-prophesied recession, the depth of which we can only guess. In the meantime, the Brexit debate has paralysed parliament – the country is not being governed as it should. Legislation has all but ground to a halt. With red busloads of irony, today, April Fool’s day was supposed to be the first working day of Brexit. It isn’t. As I have said since Theresa May was unearthed by the Snowden revelations as the queen of the illegal surveillance state at the Home Office back in 2013, she has turned into the wicked witch. In a last-ditch effort of doing exactly the same thing with different threats, May tried fooling MP’s to ensure extensions to Article 50 were stopped. She was pretending to be all ‘strong and stable’ by hiding behind the idea that an orderly exit was best for the nation. The truth is, MP’s are being herded like cattle to the cliff edge. It’s her deal or the nation gets it. This is Britain’s Prime Minister – the worst this country has ever produced at a critical moment in our long history. Given May’s form, she will work the ticking clock of chaos by threatening national economic meltdown and therefore people’s lives with it – simply to prove a point. Hardline Brexiteers who suddenly seemed to back May’s deal are seething under their false grins. You can see what will happen next. They will appear to back the withdrawal agreement, wait for the first deadline of April 12th to pass and either use stalling tactics to reach May 22nd or kill it off on the way. Theresa May cynically worked with Rees-Mogg’s radical right-wing ERG group to coordinate their operation on ruling out further extensions of Article 50. It is evidence of where Brexit is dangerously going. The battle between the government and its backbenchers continues as if no-one else existed. The result so far is only that Britain’s international reputation lies in ruins and its people threatened with an economic recession on a scale not witnessed in living memory. The entire nation could well end up as the walking wounded of its own making, whilst vulture funds pick off the corpses of a zombie business environment. It could take an entire generation to recover, longer maybe – who knows. Irrespective of your views on Brexit, something like 70 per cent of under 25s don’t want Britain to leave the EU. It’s not hard to see where that will go. They will learn to despise the older generation for destroying their already dire circumstances. Don’t forget, this young generation is the first to face declining employment and wealth prospects against previous generations, and also don’t forget, they are the ones expected to pay for the elderly and their care in the years ahead. This type of inter-generational resentment is unbelievably dangerous to the fabric of Britain’s fragile society. At this latest attempt to force an unacceptable deal at parliament, the government was emphatically beaten – again. May barked at parliament – “The implications of the House’s decision are grave,” she said. “I fear we are reaching the limits of this process” – as if somehow none of this was of her making and attempting to shift blame that the Tories were the architects of the crisis Britain finds itself in. Today, on April Fool’s day, the first working day of brexit and over the next few days, there will be more debate by parliament. The country wants all manner of responses to break the deadlock – a second referendum, agreement on the customs union or an extension to A50 to name just a few. Neglected once again, just as Tony Blair stupidly did with Iraq, was the million people marching in London last weekend. The petitions have been building up thick and fast. Parliament petitions especially. ‘Leave the EU Without a deal on April 12th’ – has, at the time of writing – 130,000 signatures. ‘Leave the EU by April 12th 2019 with deal or no deal’ – has about 30,000 signatures. ‘Revoke Article 50 and remain in the EU’ – has romped passed 6 million. The most signatures ever recorded. Theresa May simply won’t even bother answering any of these pleas. Nor the pleas of parliament or anyone else for that matter. There is simply no response. The only thing gathering speed is resentment and the chaos that a no-deal Brexit might bring. As it has turned out, right at this moment, the Remainers in parliament have the upper hand and Theresa May is looking more like a busted flush with each passing hour. For all the lies, the propaganda, the threats and bullying – Brexit has not happened because it was never going to be what they said it could be. Through disgraced national security threat and serial fantasist Liam Fox, Britain has signed up just over 10 per cent of trade deals to replace the one it currently has with the EU. At this rate, it will take another 18 years before the complete replacement value can be realised. In addition, Britain has had its independent application to the WTO comprehensively rejected. And who rejected it you might ask. Well … it was first and foremost America who said no. Then 11 other nations we were told would be our best friends in a post-Brexit world said no. The current head of the WTO said it could take years, possibly more than a decade to negotiate a WTO trade agreement. Everything, without exception that the public were told about how easy this was going to be – how much better off the NHS would be, and how our economy would be released from the shackles of the unelected bureaucrats in Brussels has simply not come true – all at. And the government has proven without any ambiguity that they have been unable to take back control, not from the EU or even itself. Quite the contrary. From day one, the EU negotiators laid out their stall and stuck by it – they have complete control. To make Brexit work, we needed to debate the options, get to some sort of consensus on the best way out, then go to a referendum based on what was known, not throw a dice and see what happens. Failure is the only thing we can all see right now. There’s a parallel there surely. The Tower of London was a resented symbol of oppression – inflicted upon London by the new ruling elite of its day and yet, whilst besieged several times, controlling it was seen to be important to controlling the country. 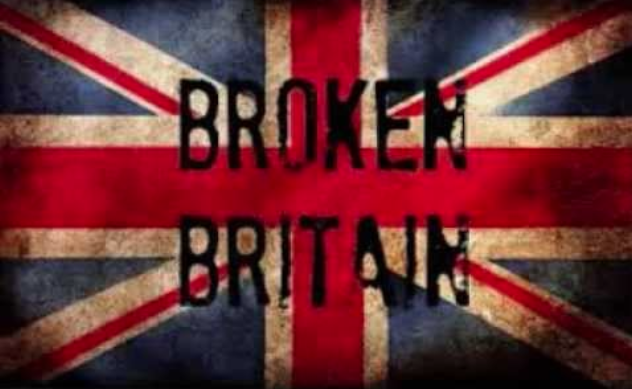 Brexit will surely be seen as a resented symbol of the failure of a ruling elite, it will be relentlessly challenged in the years ahead, it will continue to divide the country and controlling it will be what defines the nation as a whole. David Cameron was right on one thing and one thing only – Britain is broken – but never more so than since his arrival into No10. Little more than a corporate powerbroker – his ‘big society’ project, itself a dramatic political failure disintegrated while leaving a legacy of hate and division in wider society itself. It’s going to be a long road back.